I’m not a spontaneous filmgoer. I tend to lightly research films before I see them, not to reveal plot details, but just to gauge whether or not the film is well liked and if it seems like something I would enjoy, while keeping an open mind about everything. Sometimes I see films whether I want to or not to get a review out – i.e. “Twilight,” “Footloose,” etc. – but even then, I have an idea of what I’m getting myself into. When I bought tickets for the Starz Denver Film Festival, there was a bit of a SNAFU where I bought a ticket package I couldn’t redeem for the majority of the films I wanted to see, and I had six extra tickets to use. That led to seeing “Le Havre” and “Outrage,” which were both definitely worth it, and there are two more I’m looking forward to tomorrow from the same package. But for the last ticket, I decided be spontaneous, picking a movie I had never heard of and could find no reviews of called “Yukiko.” The only thing I knew about it was that it’s a Japanese film set in Paris; I like Japanese cinema, and Paris is a neat place, so why not? Here’s how the Denver Film Society’s webpage summarizes the movie: When Yukiko walks out on her boyfriend, she finds herself stranded in Paris, a stranger to the locals and their language. Mitsue offers her a place to stay, saving her from a night on the streets, and the two hit it off—but the next morning, Yukiko’s mother shows up unannounced, claiming she’s come on holiday and insisting on meeting the kind woman who has taken her daughter in. Soon enough, however, Yukiko discovers her mother’s true intentions—she’s come to find her estranged husband, who walked out on the family and expatriated to France long ago. That’s a nice description, one that implies the film has more structure and plot than it actually does. “Yukiko” boils down to 75 long minutes of people talking, usually about nothing, but not in the kind of authentically casual way that develops the characters. The conversations are pleasant at first, but it soon becomes apparent that “Yukiko” hasn’t a handle on its (extremely minor) thematic and narrative ambitions, so the film quickly becomes a tremendous slog. The haphazard script never quite knows what it wants to be; the film will briefly explore a subject like failed romance, only to find it cannot do this effectively, and then hastily brings in Yukiko’s mother to study the relationship between mother and daughter. It gets bored with this as well, and suddenly pulls in a whole new story out of left field: Yukiko’s father is in town – should she see him?!?!? Apparently not. That gets ditched too, and we’re left with a scattershot, wholly unfocused final act. Getting through only 75 minutes of this film is a real chore, but it’s all instantly forgettable anyway, so no harm done, I suppose. The production isn’t terrible, but calling it “competent” may be a bit of a stretch. Shot dully, edited with an inconsistent, distracting rhythm, and featuring a jarringly erratic sound mix, “Yukiko” looks and sounds like a TV movie, if that, which further contributes to the boredom. The acting by performers Harue Yamada, Hiromi Asai, and Katsuko Nakamura is decent; they inhabit their characters well, and though they fail to elevate the material, they make the leaden dialogue sound passably genuine. It’s also worth noting that the subtitles leave out much of the nuance of the Japanese language and are riddled with typos. That’s not the filmmakers fault, but spotting all the missing prepositions or lack of spaces between words was far more engaging than the film itself. 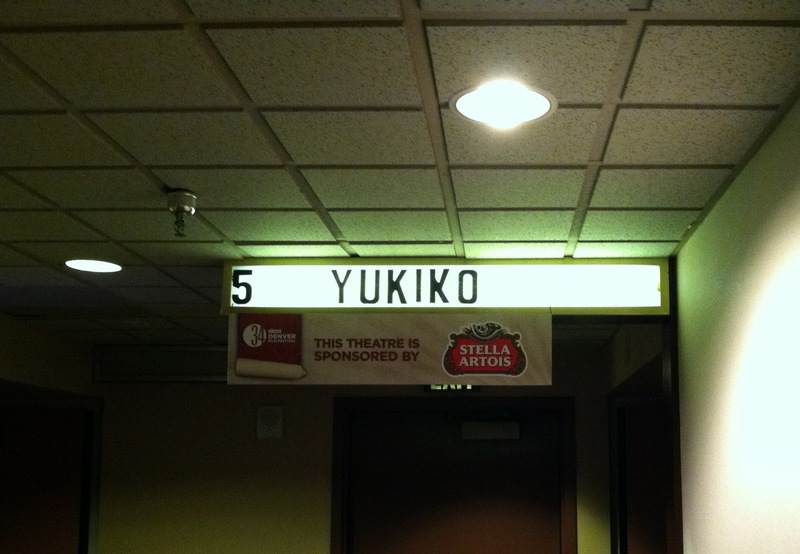 "Yukiko" will screen once more at the festival, playing at the Starz Film Center on November 12th at 7:30 PM.